Roaring Brook Press, 2017. 100 pages. Oliver’s back! He’s the cat with the pet human, Freckles. 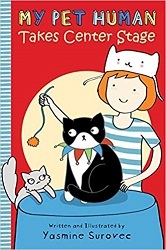 In this book, Freckles goes to school and Oliver decides to tag along. This gets Freckles to join the Fur-Ever Friends Club, where she decides to foster a kitten. Oliver is not excited about sharing his human with a kitten! To make matters worse, Freckles has plans for Oliver and the kitten to participate in a pet talent show put on by the club. This book has five chapters with pictures on every page. The dialog is all done with speech bubbles, but there is some narration from Oliver’s perspective as well, so it’s not quite a graphic novel. But it is a delightful and funny chapter book for beginning readers. They will enjoy how the world looks from the perspective of a cat. This is a beginning reader in the classic “two friends” tradition. 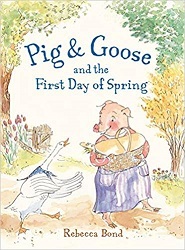 We learn how Pig meets Goose on the first day of Spring. It was spring at last. Pig was in a good mood. “The sun is shining!” said Pig. “The sky is blue!” said Pig. Pig is anthropomorphic, wearing a dress and gathering things from her cozy home into a picnic basket. On the way to the pond, Goose lands beside her. She admires how well Goose flies, so Goose offers to teach her. You can figure out how the flying lesson will end up! But I like the way they collapse into a pile of good-hearted laughter after they try it. And then they go together to eat the picnic by the pond. The second story is “A Picnic Lunch.” They share lunch and talk about how spring is the best season but then agree that all the other seasons are best, too. Pig naps in the sunshine and dreams of flying like Goose. When she wakes up, she learns that Goose can also swim. What an amazing new friend she has! That story ends with Pig inviting Goose to the party she’s having that evening, her First-Day-of-Spring Party. The final story is about the party. Pig introduces Goose to her many friends. Pig made wonderful food to eat, tells delightful stories and jokes, and laughs and dances with her friends. After the party, Goose tells Pig how wonderful she is – and I like that the author doesn’t have to explain to the reader why that is, they’ve already seen how delightful she is. Even her exuberant cry (repeated often) of “Goody Gumdrops!” tells us how enthusiastic she is about her joys. 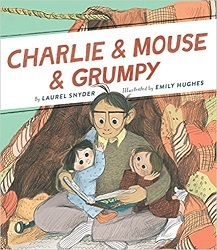 This is a picture book about friendship and about simple joys. And I like the way it shows us that each friend has something of their own to offer. I’m glad we can peek in on the start of this beautiful friendship. Picture Window Books (Capstone), 2017. 96 pages. Here’s a lovely beginning chapter book. There are three stories with three chapters each. There are full color beautiful pictures throughout. I like the story because it’s about a great big family. I have a great big family, and these are rare in children’s books. This particular family is Hispanic and they have brown skin. 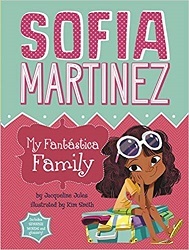 Their speech is peppered with Spanish words (printed in red and defined in the back), but otherwise these are simply fun family stories. In the first story, the whole big family is going to spend a week at the beach. Sofia decides to pack games instead of very many changes of clothes. (This won my heart right from the start.) When they get a rainy day, Sofia’s a hero. The final story is about the whole family going shopping for school supplies and the preschool-age cousin getting lost in the store. Again, this is all done with big colorful pictures, simple language, short chapters, and Sofia’s personality shining through. 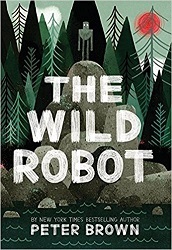 This is a great new heroine for kids ready for chapters. Gecko Press, 2017. Originally published in Sweden in 2016. 108 pages. 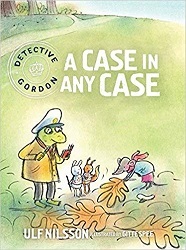 A Case in Any Case is part of the Detective Gordon series. It’s a gentle woodland mystery series for readers ready to begin chapter books. It’s got twelve short chapters with abundant colorful illustrations, and is very child-friendly. Police Chief Gordon, a toad, is trying to retire. He has left Detective Buffy in charge of the woodland police station. She is a small mouse. She tries to be brave when she hears a mysterious scrabbler outside the station at night. But she thinks perhaps she should call in Detective Gordon. Police Chief Gordon is not enjoying retirement. In fact, he finds himself drawn back to the police station…. But when the two meet up, they don’t get a chance to investigate the mysterious visitor, because two small children are missing! In the investigation that follows, the talents of both officers are needed to save the day. This is a classic friendship early chapter book – with a mystery twist. It’s a gentle read, with subtle humor, but leaves you smiling when you’re done. HarperCollins Children’s Books, 2016. First published in Great Britain in 2015. 94 pages. I’m going to list this book with Beginning Chapter Books, but there aren’t actually any chapters. However, the pace, length, and reading level are consistent with other Beginning Chapter Books. There are black-and-white drawings by Judith on every spread, keeping young readers interested. The story opens with Mister Cleghorn sitting on his balcony watching the sunrise, wondering how he will get through the whole day. I should never have sold the shop, thought Mr Cleghorn, even though the people who bought it had paid him a tidy sum. Whatever am I going to do with myself? Later that day, Mr Cleghorn gets an invitation to visit his cousin and his family. Cousin William is a fisherman, and William’s son Tommy has been watching a cute seal pup by the shore. Mr Cleghorn takes an interest in the pup as well. Then one morning he found the little pup lying listlessly on its rock. It looked up for a moment at the sound of the oars, but turned its head away at once and lay down again. It seemed sad and thinner than before. William tells him that some seals were shot the day before, and the pup’s mother must have been one of them. It can’t live without its mother, so they should put the pup out of its misery. But Mr Cleghorn can’t bear to let the pup be shot, so he decides to take it home with him. He plans to take it to the zoo right away. Next comes the adventure of getting the pup home and figuring out what to feed it. Once there, he needs to hide it from the janitor. When he accidentally leaves the water running with the pup in the tub – he meets his downstairs neighbor, the lady with the birdcage. She becomes his ally in hiding the pup from the janitor. Her father was a vet, and she even knows the keeper at the local zoo. But when the two of them go to the zoo, it has a new owner and has fallen into disrepair. 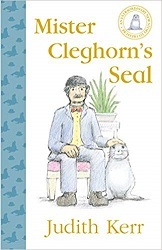 The rest of the book is about trying to find a permanent home for the seal pup, yet keep him hidden while they are looking. The eventual solution makes everyone happy. I always loved this story. I wished I could have known the little seal, and I wished more than anything that the story could have had a happy ending. Perhaps that is why, more than a hundred years later, I have made up a different story, which has one. I’m thinking of this as a quieter version of Mr. Popper’s Penguins. Charming. Henry Holt and Company, 2016. 120 pages. Bunjitsu Bunny’s back! 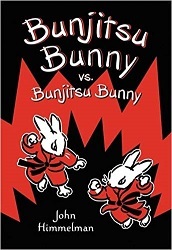 Isabel the Bunjitsu master is back in this third book of short stories about fighting well and knowing when not to fight. As before, most of the short well-illustrated chapters have some kind of kicker to the story. 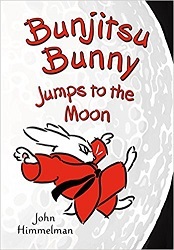 My favorite is “The Floating Rabbit” where their teacher challenges them to get from one circle drawn on the floor to another on the other side of the room without touching the floor. Isabel figures out to ask her friends to carry her. There are 13 short chapters in this book. The print is large and there are pictures on each spread, so this is a perfect choice for kids ready to start chapter books. Everyman’s Library Children’s Classics, 2013. First published 1924. 157 pages. Last year I wrote Project 52 – each week reflecting on one year of my life. Which brought back memories. And one of the memories was about which chapter books I read when I was still small, before we moved away from Seattle. 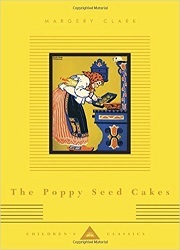 One of those first chapter books was The Poppy Seed Cakes. I hadn’t read The Poppy Seed Cakes in years. But remembering it made me want to get a copy and hold it in my hands and read it over again. So I looked on Amazon and was delighted to find an Everyman’s Classics edition. Once the book arrived, I read it immediately. All the pictures and page decorations are there! And I remember every single one and greet them all as old friends. There are many full-page illustrations, alternating between color and black and white. But there are also decorative patterns on each page, with each chapter having its own theme, and the pattern enclosing the text. For example, the chapter “The White Goat,” has a stylized picture of a goat parading across the top of the page. “Erminka and the Crate of Chickens” has chickens across the top, and “The Picnic Basket” has a goose reaching for a picnic basket. I am very sad I didn’t think of ordering this book when my own children were small, because I find it’s a book that begs to be read aloud. In fact, I’ll admit that I read some of it aloud even when sitting in my own home all alone. The phrase “Andrewshek’s Auntie Katushka,” which appears over and over just doesn’t want to remain silent in your head. The stories are old-fashioned and quaint – but do stand the test of time. And the language! First we have stories about Andrewshek and Andrewshek’s Auntie Katushka. Andrewshek’s Auntie Katushka asks him to do something while she is gone – and Andrewshek consistently chooses to do something else – with varying results. Though they usually manage to deal with said results. Then we have stories about Erminka and her red topped boots. They are her brother’s, and they are too big, so wearing them gets Erminka in trouble more than once. At the end of the book, the stories come together when Erminka comes for a tea-party at Andrewshek’s house. With poppy seed cakes. Andrewshek’s Auntie Katushka spread a clean white table cloth on the table under the apple tree in the garden. She brought out two plates of poppy seed cakes and five cups and saucers and five spoons and five napkins. Then she went back into the house to get some strawberry jam. The white goat and the kitten and the dog and the two chickens came and sat down on the bench beside the table under the apple tree in the garden. They sat very quiet with their hands folded. Andrewshek’s Auntie Katushka came out on the porch with a bowl of strawberry jam in her hand. She saw the white goat and the kitten and the dog and the two chickens sitting quiet on the bench, with their hands folded. Simple stories and simple concerns, with a happy ending. Though a modern child probably won’t hang out with geese and goats and chickens like Andrewshek and Erminka, they will understand how easy it is to be distracted, the lure of new boots, and the delight of eating poppy seed cakes. You are currently browsing the archives for the Beginning Chapter Books category.